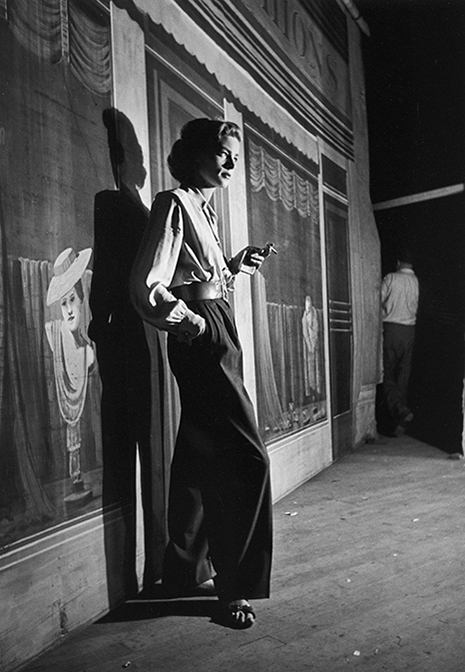 LAUREN BACALL, included in the National Portrait Gallery’s “American Cool” exhibition, through September 7, 2014. Artist: Alfred Eisenstaedt, 1949 (printed 2013). Pigmented ink jet print. Lauren Bacall was definitely cool. Each generation has certain individuals who bring innovation and style to a field of endeavor while projecting a certain charismatic self-possession. Lauren Bacall is one of the figures selected for the National Portrait Gallery‘s “American Cool” exhibition. Ms. Bacall was 89 and a longtime resident of Manhattan’s Upper West Side. Launched by a Harper’s Bazaar cover when she was a 19-year-old model, the former Betty Joan Perske, born to Jewish immigrants in New York City, was signed by Warner Bros. in 1943. A star was born. So was a legendary off-screen romance with and marriage to Humphrey Bogart, with whom she made four films. Other memorable roles that made Ms. Bacall a Hollywood legend were The Big Sleep (1946), Key Largo (1948), How to Marry a Millionaire (1953) and The Mirror Has Two Faces (1996). Once Bacall left Hollywood for New York in the late ’50s, she found a new career working on Broadway, where, despite her raspy singing voice, she won Tony Awards for the musicals Applause (1970) and Woman of the Year (1981). In my opinion, she was one of the most beautiful and talented actresses in Hollywood. She had ‘The Look’ — cool and mysterious — and she had the sound, courtesy of that irresistibly low and throaty voice. Thanks for the memories, Lauren. Art director Antonio Alcalá worked with graphic designer Gail Anderson of New York City to produce the stamp. To evoke the look of broadsides from the Civil War era, they employed Hatch Show Print of Nashville, Tennessee, one of the oldest working letterpress print shops in America. Courtesy of USPS.com. The 85th Annual Academy Awards nominations were announced early this morning. Leading the pack with 12 nominations — including for best picture — was Lincoln, directed by Steven Spielberg. I saw Lincoln last weekend and thought it was excellent — definitely my choice for this year’s best picture. I also predict that Daniel Day-Lewis (Abraham Lincoln), Sally Field (Mary Todd Lincoln) and Tommy Lee Jones (Thaddeus Stevens) will win for best actor and supporting actress/actor for their performances in the film. 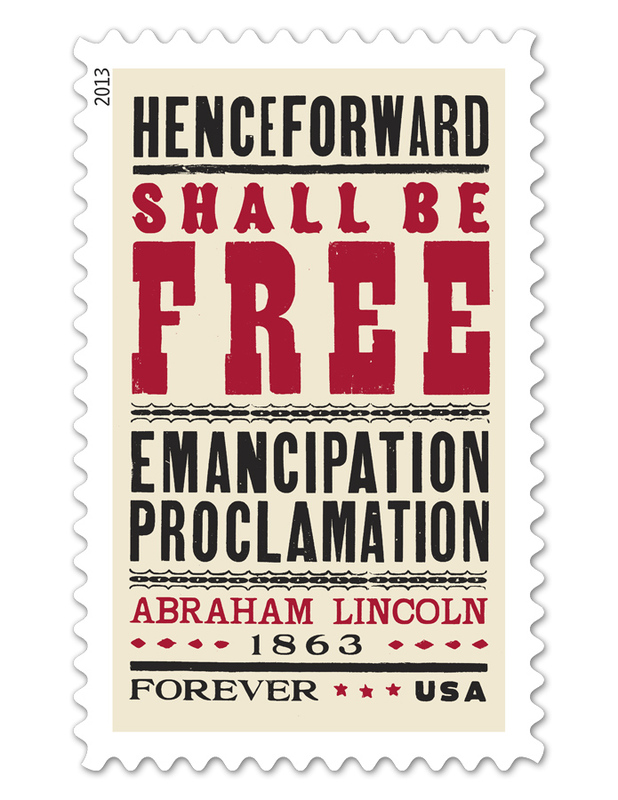 On a related design note, the 2013 Emancipation Proclamation (Forever®)stamp was issued by the U.S. Postal Service on January 1 and commemorates the 150th anniversary of the Emancipation Proclamation, which President Abraham Lincoln signed on January 1, 1863. The Emancipation Proclamation stamp is one of a civil rights set being issued in 2013.